Own a beautiful piece of art for your vehicle, while supporting the beautiful Cahaba River. When you purchase a “Save the Cahaba” tag, $41.25 of your donation goes directly to the Cahaba River Society in support of its work to protect and restore the Cahaba River Watershed and its rich diversity of life. Already have the Cahaba tag? Please renew! Don’t have it yet? Get the tag that protects your drinking water! The added fee allows you to personalize your plate at no extra cost. 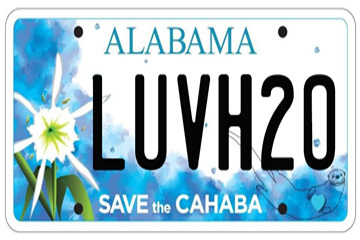 If your plate is already personalized, you can have a Cahaba tag for the same fee–no extra cost–and the funds come to Cahaba River Society to protect the River! Where can I get a “Save the Cahaba” tag? Can I get a “Save the Cahaba” tag for my other motor vehicles? “Save the Cahaba” tags are also available for motorcycles and boats. *The Cahaba River Society is a nonprofit organization. Your donation is tax deductible. Cahaba River Society is forever indebted to designer Umair Khan and Doug Barrett, Associate Professor of Graphic Design, UAB, for this remarkable interpretation of the Cahaba River. Check out this coverage of the “Save the Cahaba” car tag’s new design from BhamNow.